Multi Vit Shots are tongue tingling melty shots containing 19 multivitamins and minerals especially suited to young adults and their needs. Contains iron and vitamin C which contribute to the reduction of tiredness and fatigue, something very common at this age. Also with vitamins B6, B12 and D, zinc, iron and selenium which contribute to normal functioning of the immune system. Sweetener: sorbitol; fructose, ascorbic acid, acidity regulator: citric acid; colour: beetroot powder (acidity regulator: citric acid); ferrous fumarate, thiamine mononitrate, ribiflavin, dl-alpha tocopheryl acetate (anti-caking agent: silicon dioxide); emulsifier: carboxymethyl cellulose; calcium pantothenate, nicotinamide, potassium iodate, zinc citrate, natural flavouring (emulsifier: acacia gum; humectant: triacetin); natural flavouring (emulsifier: acacia gum); cyanocobalamin, pyridoxine HCl, manganese sulphate, sweetener: steviol glycosides; anti-caking agent: magnesium stearate; sodium selenate, chromium trichloride, retinyl acetate (emulsifier: acacia gum; medium chain triglycerides, anti-caking agent: tricalcium phosphate); cholecalciferol (emulsifier: acacia gum; medium chain triglycerides, anti-caking agent: tricalcium phosphate); phytomenadione (emulsifier: acacia gum; anti-caking agent: tricalcium phosphate); d-biotin, folic acid, copper gluconate. Children over 13 years, and adults, take one sachet a day with a meal or as your health professional advises. Tip contents of one shot onto tongue and swallow. B vitamins may turn urine bright yellow – this is normal. Do not exceed recommended daily intake. Food supplements should not be used as a substitute for a varied and balanced diet and healthy lifestyle. Excessive consumption may produce a laxative effect. Store in a cool, dry, steam free environment out of reach of children. Below are reviews of Higher Nature Young Adults Multi Vit Shots - 14 Sachets by bodykind customers. If you have tried this product we'd love to hear what you think so please leave a review. 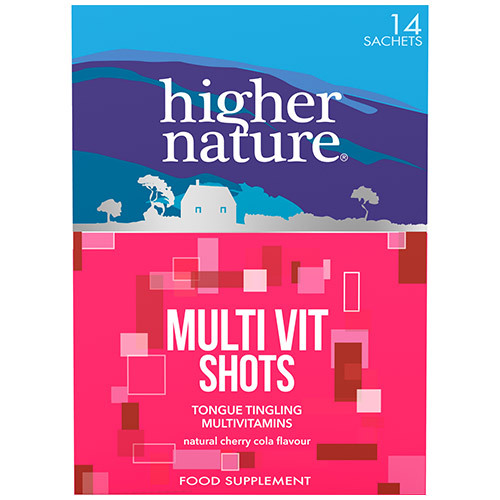 Multi Vit Shots are tongue tingling melty shots containing 19 multivitamins and minerals especially suited to young adults and their needs. Contains iron and vitamin C which contribute to the reduction of tiredness and fatigue.